Miata cooling system thread - Page 6 - Miata Turbo Forum - Boost cars, acquire cats. This location lends itself nicely to a NACA duct in the splitter, as I recently advised someone who has this kit to do. Will take pictures of it soon. I recently completed an install of the WRX vents in my hood as well. The only information I have however is from street driving. BEGI S turbo kit w/ intercooler. 190 on the highway and 215 in town driving. Maintains 185 highway, 210 in town. Can run AC on highway and it stays at 190, unless a simi trailers length behind another car, then would get to 200-210. Did not run AC in town. Maintains 179 on highway, 200 in town, With AC running: 179-181 highway, 210 in town. Pretty good data. You buds with Jeffbucc? Thanks for the data points. No one test seems to ever be 100% conclusive, but the more people that take the time to put some decent controls into their test, the more useful that compiled data is. Naw, I have been trying to catch a glimpse of his car around town though. I will need to park my car as far away from it as possible though, to keep me from looking at all the scratches and dings it has compared to his full on restoration. I installed louvers in my hood and cut the bracing. Hood doesn't seem flimsy at all! 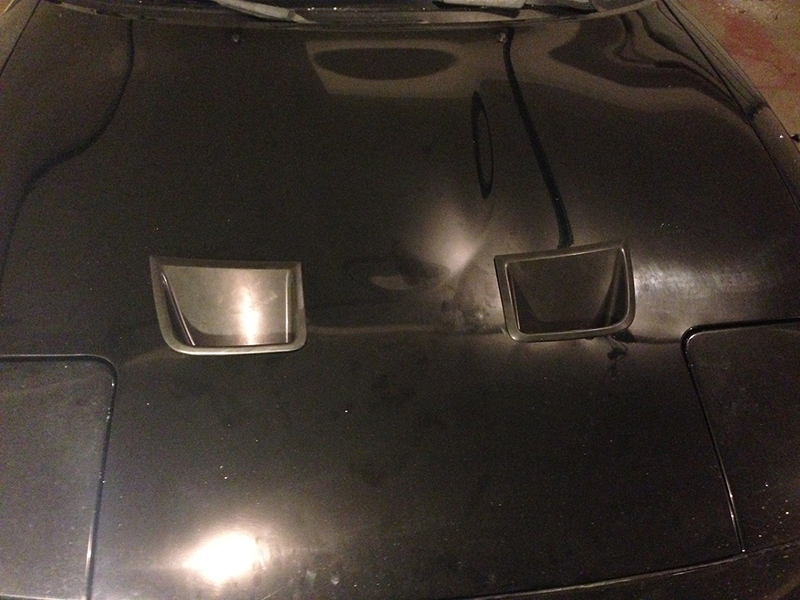 BTW, it's pretty easy to do A-B tests with hood vents using some well-placed painter's tape to block them off. If the tape blows off, well, that tells you something right there. If the tape blows off, well, that tells you something right there. I did another cooling project (controlling airflow) on mine inspired by and old photo of Crusher, walls between the frame rails and the hood to shield the dome filter and master cylinders from radiator air. I saw 65C IAT when slowing down after a tuning run before and after only 5-10C above ambient (more if I let it sit for some time). When running only 2C over ambient. And the plastic material did not deform during a track test either (only 10-15 min runs though), but no temp logs from that. I have not measured the pressures or flows but with no splashguards at all I would not be surprised if the wheel well pressure is higher than the engine bay pressure (supported by the NB air intake hole?). In that case I now have a flow of cool air to the intake and flowing past the master cylinders. The plastic have held up for one test day and a race week och sprints. Nothing hotter than 80F ambient though. It have melted/softened where the hood rubs, so it's now reasonably tight fit. Been lurking in this thread for a while. I really enjoy seeing this sort of discussion. 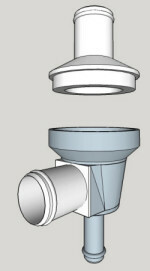 I've created a 3-d model in sketchup of an improved replacement to the m-tuned thermostat housing. I believe this would solve a TON of issues - maybe 20% cooling ability over the m-tuned reroute? I just don't know how to create an actual piece of hardware. What you've designed there is similar to the the OEM thermostat from a '70s vintage BMW 2002. Stant P/N 13578. 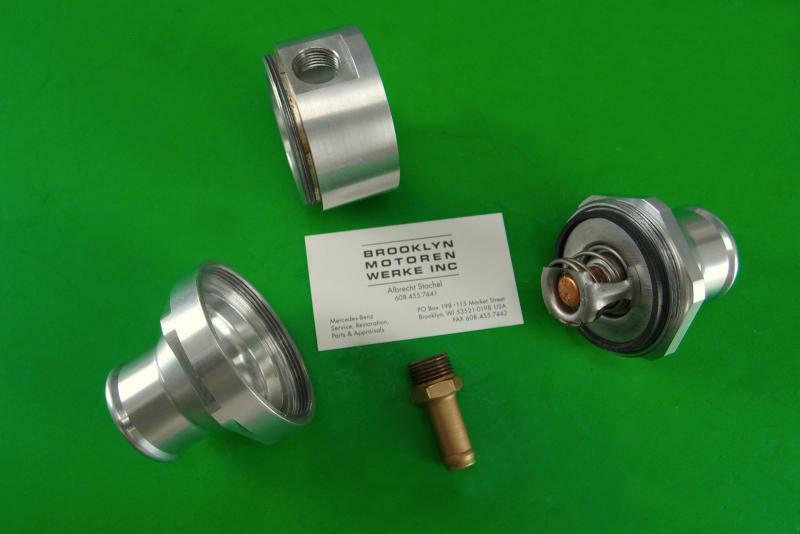 Billet Aluminum Bypass Thermostat for Mercedes-Benz Ponton (180a, 190, 219, 220, 220a, 220S) and Unimog 404 | Brooklyn Motoren Werke, Inc. Bypass thermostats are indeed the best of all possible scenarios. No need for a mixing manifold. If you really wanna get fancy, do the same on the heater core outlet. Note that the aftermarket units above are not equal to the BMW part. Haha. I really meant for that video to be a joke years ago. Keeps popping up. My experience in doing that test was that, for the specific units which I tested, the "Superstat" unit took longer to open, and reached a smaller total opening, than the standard unit. Emilio's data, that the Superstat should provide superior flow, contradicts my observation. As I made only visual observations and did not perform an actual flow test, I cannot say with 100% certainty which is correct. It is possible that Stant merely has really bad QC, and that the units which I tested differ greatly from Emilio's. 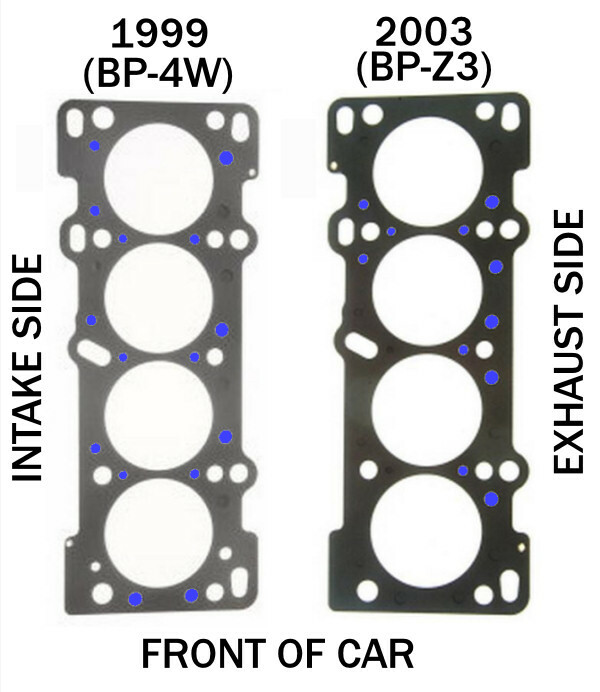 Also, I note that nobody has yet posted actual pictures of the difference between a '94-'00 head gasket and an '01-'05 gasket, to illustrate what Mazda was trying to accomplish, and where the concern about doing a reroute on the VVT engines originated from. In the early design, you can see that the coolant passages are fairly evenly distributed across the gasket. In the '01-'05 design, this has changed radically. The holes are now clustered around the #2 and #3 cylinders, and heavily biased towards the exhaust side. This is a very good compromise design, if we presuppose the necessity of a front-thermostat, rear-heater layout. 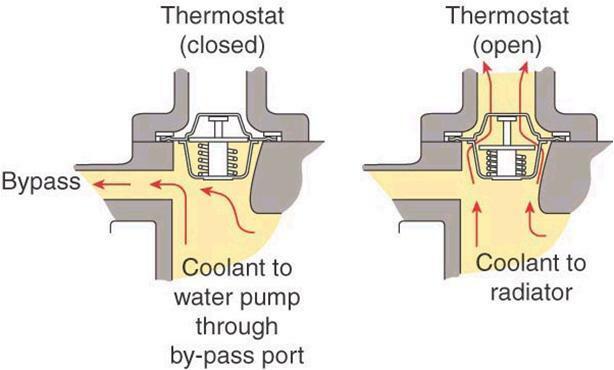 When the thermostat is open, coolant will flow up through the middle of the engine, and then move both forwards (towards the thermostat) and rearwards (towards the heater core outlet) to exit the engine. Thus, the flow of coolant across the front and rear of the head is fairly even. I was one of the first to raise a concern about this about 4-5 years ago when we first started seriously discussing the reroute concept in the VVT engine. Specifically, my concern was (and continues to be) that with the front thermostat port blocked off completely, you can clearly see how the area around the #1 cylinder will receive virtually no coolant flow at all, with extremely little flow around the intake side of #2 as well. This concern was based, as Curly notes, purely on conjecture. To this day, I have yet to test a reroute on an '01-'05 engine with the stock head gasket. 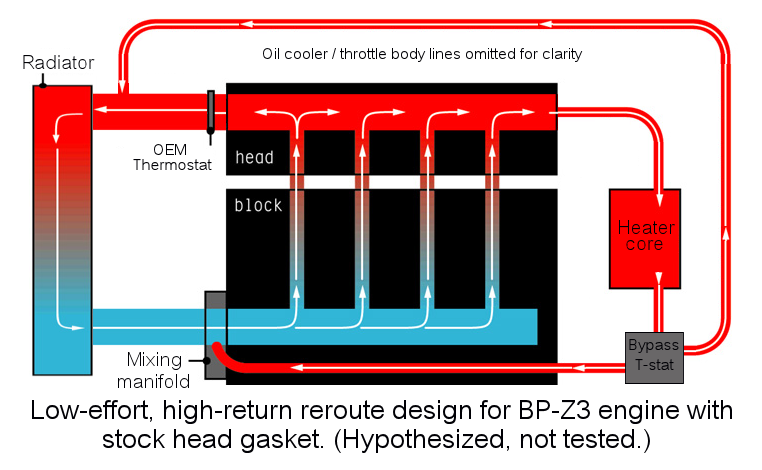 To the best of my knowledge, nobody else has actually instrumented the head itself (eg: by drilling into it and installing thermocouples in different locations across it) in a way that conclusively proves or disproves the notion that a rear-thermostat reroute will actually increase the temperature differential across the head, even though average operating temperature may go down. In my opinion, the most optimal cooling system configuration for an '01-'05 engine, presupposing that the stock head gasket is still in place, is to leave the front thermostat alone and add a bypass-style thermostat to the heater core outlet which selects between the upper radiator hose and the mixing manifold depending on temperature. While this is purely speculation, I see no reason why this configuration should not provide both the most even temperature distribution across the head, and also the greatest capacity for overall heat removal. Please note that the BMW thermostats are available for as low as $19 before expending a lot of effort recreating them. Does that BMW one block the bypass? When the thermostat opens? I built a reroute with one of those BMW tstats about 10 years ago. Worked well on a turbo NB track car. That experiment led to the M-Tuned kit that we and FM sell now. Electric water pumps: We have preliminary results. We installed one with a very cool controller on our supercharged NC. The thermostat is removed as is the stock water pump impeller. The water pump cycles depending on water temp - when the car's cold, it pulses for a few seconds at a time to keep coolant moving. Then it starts to increase duty cycle and speed with temperature. No instrumented testing, just a torture test. At our Summer Camp, we run the FM cars twice as often as the customer cars. It's a short, tight track with a lot of acceleration and limited airflow. Our air is thin and dry, so it's pretty much a worst-case scenario for cooling cars. The FM cars run for about 10 minutes, then get a 25 minute rest. The heatsoaking starts to really punish the cars as the day goes on. Ambient temps were roughly 95F. We know from previous years that the supercharged NC will start to overheat fairly soon with this treatment. With no other changes other than the electric pump, it didn't even budge the gauge. So far, very good. 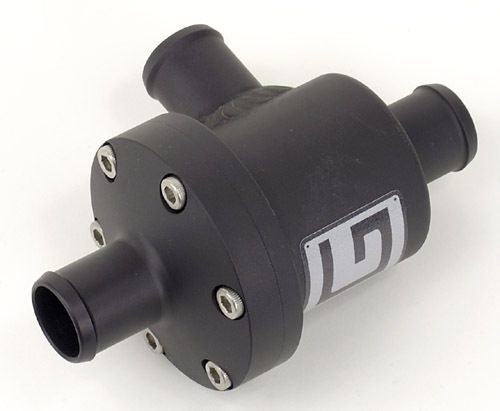 We're going to install one on our turbo NB next. You're using the Davies-Craig pump and controller? It's a Davies Craig, but I'm pretty sure there are multiple models. Not sure on the specifics of this one myself. Davies Craig added a metal version of the WP about a year ago IIRC. I think that is in response to requests from the motorsports community. When we saw the original plastic housing version at the PRI several years ago, that was the first question I asked. You could sorta tell he got asked that a lot at that show since the guy bristled a bit and regurgitated a kind of canned answer. In any case, I have heard and read first hand reports of the plastic version holding up just fine in motorsports applications. We bought one years ago but never installed or played with it. Eagerly awaiting more data from Keith. The one we used does indeed have a metal housing. I think it's bigger than the plastic one we tested years ago. 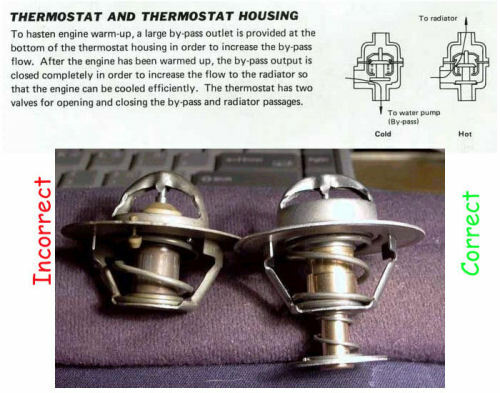 To elaborate, for those not familiar with bypass thermostats. The idea here is to give the water exiting the engine an either-or choice of where to go. When cold, it's sent to the mixing manifold and prevented from entering the radiator. When hot, it's sent to the radiator and prevented from entering the mixing manifold. The Bell "Racer" reroute attempts, rather inelegantly, to solve this problem by directing the heater core return to the upper radiator hose all the time. 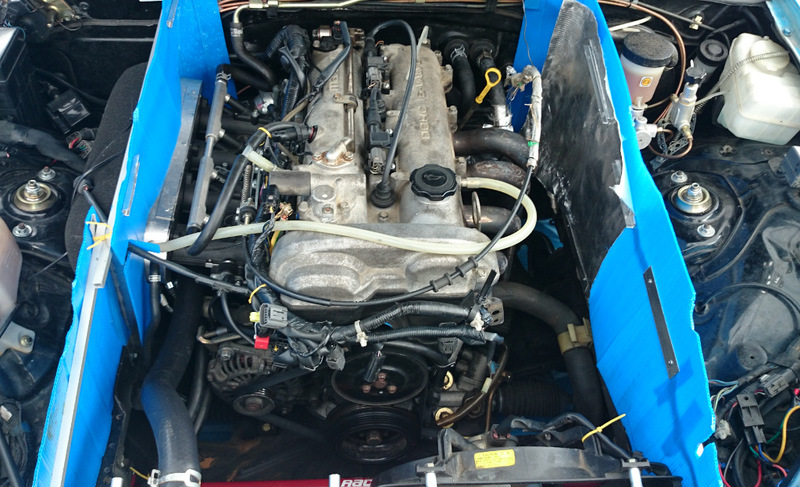 That does solve the problem of hot water being re-introduced to the engine via the mixing manifold, however it creates a new problem- extremely long warmup times. Essentially bypassing the thermostat entirely, this presents a nearly catastrophic scenario for street-driven vehicles frequently operated in climates which are less hot than Death Valley in August. 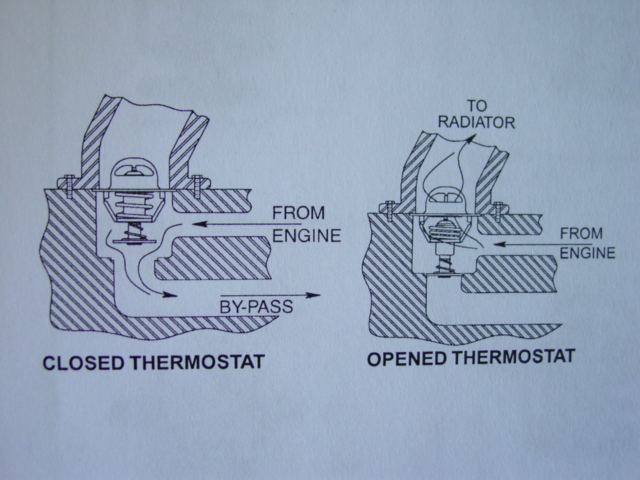 In order for us to achieve the most optimum possible configuration (maximum cooling capacity, plus quickest warmup) for a vehicle subjected to extreme use, we must deal with the heater core outlet, diverting it to the upper radiator hose when the coolant is hot, and allowing it to enter the mixing manifold only when the coolant is cool. 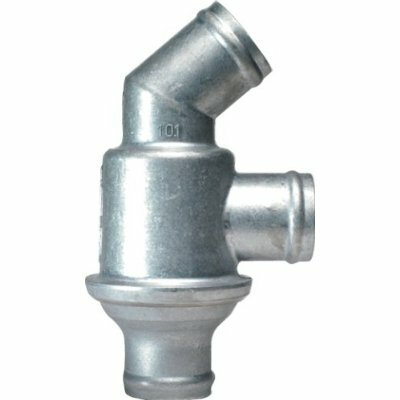 I hypothesize that one could achieve excellent results on an '01-'05 engine (possibly better than what is achieved by doing an M-Tuned style rear-therm reroute on a '94-'00 engine) by leaving the OEM design completely alone and simply adding a BMW-2002-style bypass thermostat to the heater core outlet, selecting between the upper radiator hose and the mixing manifold. I'm undecided as to whether the bypass thermostat should have the same rating as the main thermostat, or if it should have a slightly cooler rating. I first proposed this about 6 years ago, except with an oil thermostat, not realizing at the time why that wouldn't work, and not then being familiar with bypass-style water thermostats. It is my intention to do exactly this to my recently-acquired '04 whenever it comes time to add boost. To this day, I have yet to test a reroute on an '01-'05 engine with the stock head gasket. To the best of my knowledge, nobody else has actually instrumented the head itself (eg: by drilling into it and installing thermocouples in different locations across it) in a way that conclusively proves or disproves the notion that a rear-thermostat reroute will actually increase the temperature differential across the head, even though average operating temperature may go down. I haven't heard of that testing done either. I will say that Thumper uses a BP6D gasket (01-05) and a reroute and it hasn't blown up in spectacular fashion yet. 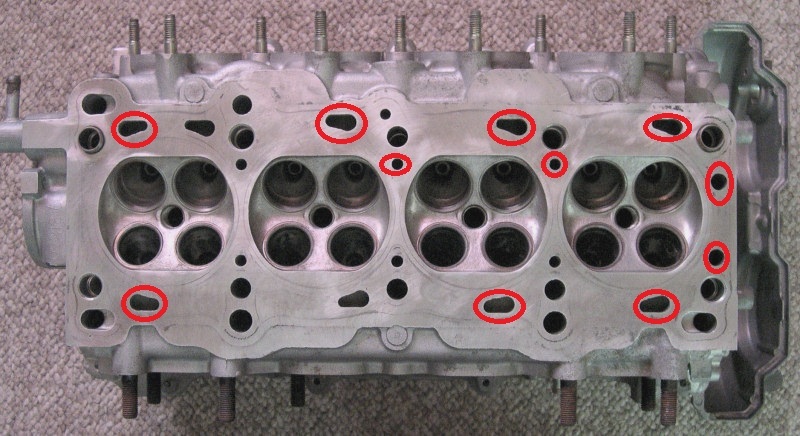 One more note on the differences between VVT heads and '99 heads. When Mazda changed the head gasket design, they added several cooling ports to the surface of the 01+ head (including the MSM). As a (likely unintended) result of this, nearly every coolant port on a 99-00 head ends up blocked off if you use a 99-00 head with an 01+ gasket. Out of 17 total ports, eleven of them end up blocked, with cylinders #1 and #2 sharing a single coolant port between them. Not good at all. If you were thinking about using a BP6D gasket on your early engine to forego a reroute, don't. Where did you find that picture? I actually took that years ago and posted it on M.net during the JasonC thread, but it got nuked from my Picoodle account and I haven't been able to find a copy of it.